Everything you will need for the perfect family holiday! 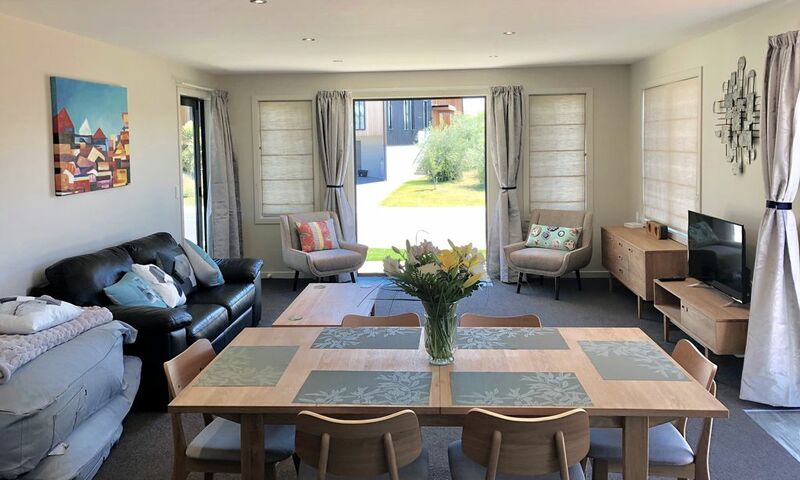 Situated a short drive or an easy walk to town centre and the lake the front, this three bedroom home offers everything you will need for the perfect family holiday! The traditional open plan kitchen, dining and lounge area features all new modern decor. The heat pump will keep the house beautifully warm in winter. In summer, the outdoor dining area provides a sheltered haven. Shady from about 6pm just in time for pre-dinner drinks. The kitchen is fully equipped with all the modern conveniences including a Nespresso machine. Everything in the kitchen is brand new and high quality. Includes Freeview, Netflix and Wifi. All beds and bedding are new and excellent quality. We are upgrading bedroom heaters to high quality Dimplex Panel heaters from July 2019. The second bedroom has two very comfortable long single beds which can conveniently join together to make a super king. A roll-away suitable for a child is available. Hot water storage cupboard equipped with shelves for drying wet ski gear over night and a garage for all your skis and bikes. Very comfy, clean, well appointed house for the 5 of us. Plenty of towels and extra blankets. Only negative for us were the pillows. Although there were plenty of them they were all extremely high with most of us unable to sleep on them. Some lower choices would have been good. I had purchased quite high quality pillows but perhaps I need to mix them up with some flatter ones. Will look into this asap. Thank you for your valuable feedback. We adored this house, it was a home away from home during our time in wanaka. The kitchen was really well stocked, the garden was a lovely spot for a family BBQ in the evenings, the air con was great in the living room and kitchen but the bedrooms did heat up quite a bit. It was great to have a garage to keep the car cool and out of the sun. For us the property was a little too far from the town but we knew this when we booked. Overall we loved our stay here. Very well appointed 3 bedroom home in a quiet street about 20min walk into Wanaka town centre. Very clean and tidy, everything you need for an enjoyable holiday. The property is self catering however we do leave a couple of rolls of toilet paper per toilet to help get you started. We also provide council issued rubbish bags along with recycling bins. Our cleaners are meticulous, the smell must of been from cleaning product as we had flushed the jets of the spa bath with jet cleaner prior to stay. The property is nice and clean. Kitchen amenities are beyond sufficient. Most of all, it’s very child friendly. This is a great bach in a quiet suburban location. It was a short drive to the township and Lake Wanaka. The home was well appointed and the beds were comfortable. We would stay here again. The heat pump was great for heating the living area but I could see the panel heaters in the bedrooms struggling to keep the rooms warm in cold weather. Thanks for your feedback. Regarding the heaters, we have extras we put in the house for winter, winter duvets and electric blankets. Not too worry, we make sure our guests are warm.